24-month Warranty and 1 month money back guarantee. 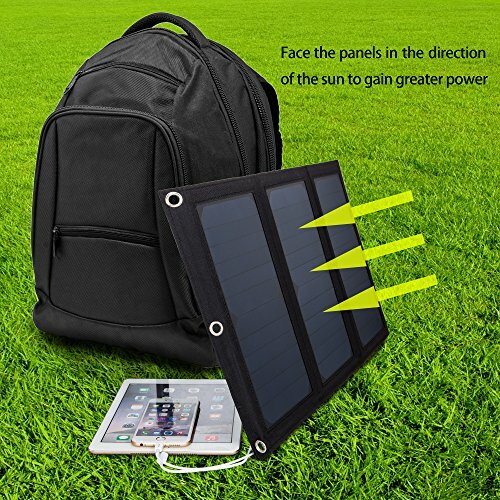 Compared to other solar chargers, an extra PCB cushion is added between PET panel and fabric canvas to enhance its strength, protecting it from breaking or morphing, and making it perfect for outdoor activities such as hiking, camping, etc. 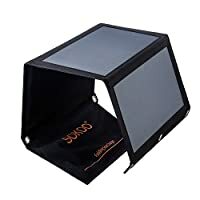 One solar charger is for all USB gadgets, including Android devices, iPhone, iPad, GPS, GoPro, digital camera etc. This product doesn't contain a built-in battery. 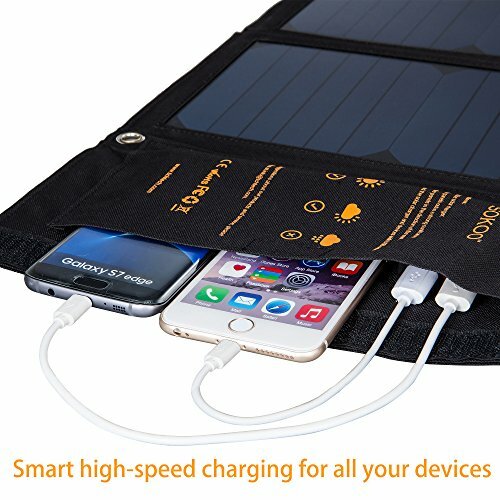 To protect your charging devices from overheating and stop charging, please place the phone under cool and well ventilated area, and connect the phone with the solar charger under sunlight via an USB cable.. 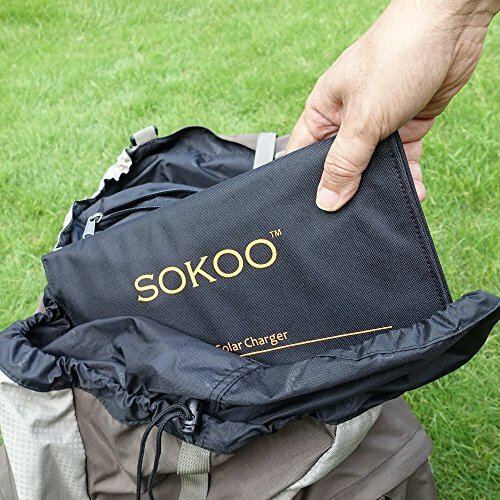 Even though the solar charger has waterproof function, minimizing moisture exposure to protect electrical components is recommended. Water-Resistant and Incredibly Durable: Smart IC Circuit with waterproof treatment and rugged high-wear PVC fabric canvas, provide you with worry-free in any outdoor environments and activities, including water sports, thunder storm, high humidity weather. Will recharging immediately and quickly whenever there is sunshine. 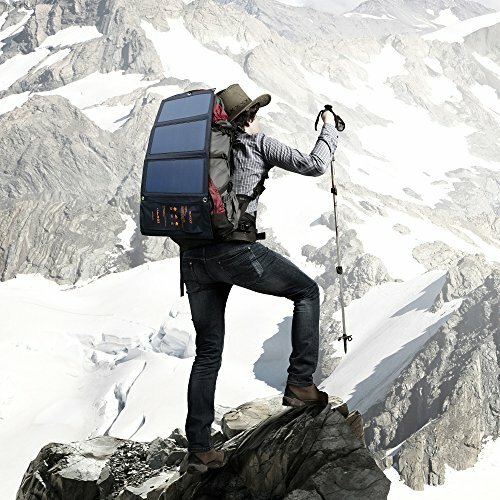 Remarkably High Conversion Efficiency: Its SunPower solar panel array has a world leading solar energy conversion efficiency, almost twice as efficient as most of other folding solar chargers in the market. Dual-USB Smart Charging Technology: The build-in smart IC chip intelligently identifies your device, and maximizes its charging speed while protects your devices from over charging and overloading. The charging current of USB ports (up to 2.4A max 5V DC per port or 3.3A max overall) is monitored and automatically adjusted according to the sunlight level. 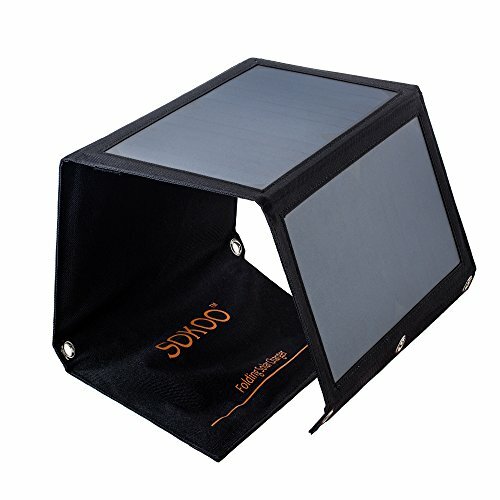 Highly Portable: Compact size(12.20 × 6.69 in folded) and copper-alloy eye-holes on each corner allow easy attachment to backpacks, trees, or tents. Lightweight (17.5 oz) and ultra-thin design (1.6in folded) make it perfect for outdoor activities. No built-in battery. 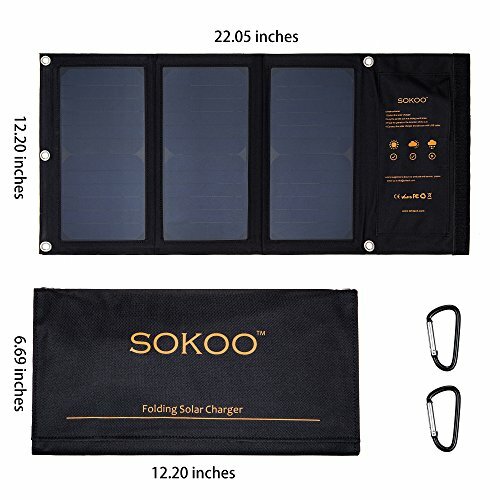 What You Get: SOKOO FSC-22 22W 2-Port USB Folding Solar Charger, user manual, 2 attachment hooks, our 24-month warranty and friendly customer service.